I am a Pure Barre addict. There, I said it. And it only took me one class to become completely hooked. After months of researching (literally), I decided to try my first class this past February. I was looking for something I could do consistently and that I would not get bored with. It's now June and I'm still going strong! 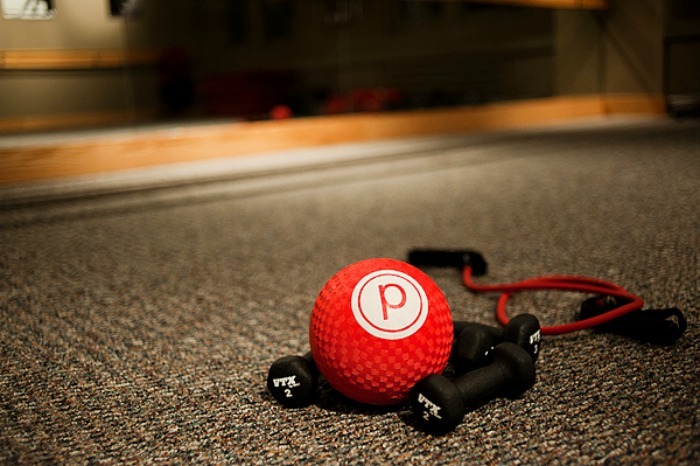 Now, what exactly is Pure Barre? It's a 55 minute, full body, low impact workout that uses small isometric movements to tone all the problem areas women generally struggle with. The class starts with a warm up to get your heart rate up and get you prepared for class. You'll then move to arm work, thigh work, seat work, and finally, ab work. Each section of work is followed by stretching the muscle group you just worked. This helps to lengthen your muscles and give you the "long and lean" look. You'll use some equipment during the class - a ball, weights, a mat, and a resistance tube - but don't worry, they provide all of it for you! I could seriously go on and on about why I love Pure Barre, but I'll give you some of my top reasons. Until I tried my first class, I hadn't felt that "we're all in this together" feeling since I left playing team sports. You'll have a wide variety of women (and sometimes men) in your class, and that's what makes it great. Everyone is at a different stage of fitness, but every single person will be able to relate to the struggles you're having in class. Next, I have never felt my body changing as quickly as it has with Pure Barre. I can almost instantly get into my "shaking" zone (shaking is very, very good!) and know that I am working hard and changing my muscles for the better. Lastly, I have been introduced to some seriously cute fitness apparel brands. There's a little area at the front of the studio dedicated to clothing, accessories, and anything and everything you'll need for class. I practically live in workout gear during the week, so I love finding unique items! Wear the right clothes. It's highly recommended that you wear long pants or capris, because some of the moves would be really awkward to do in any type of shorts. It gets pretty warm in the room, so I normally wear a tank top of some sort. I also highly recommend buying some sticky socks. They sell some in studio, or you can find some from specialty workout clothing brands. Eat something prior to class. I normally drink my cup of coffee and have either a Kind or Luna bar. If I eat anything more, I tend to feel a little sick. Same goes for not eating anything before class. Ask questions! Your instructor is your best resource for learning how to properly do the moves. They'll come around and individually correct form during class, but I can't stress how important it is to talk to them if you don't understand something or it just doesn't feel right. The moves will feel really unnatural at first. Especially when they tell you to "tuck". Don't get discouraged. I felt like an uncoordinated baby giraffe my first class. There will be people there that know exactly what's happening next, and they look like pros. Don't worry, this will be you after you get a few classes under your belt! Bring a towel and some water. Like I said before, it gets extremely hot in the room, especially now that it's summer. It's important to keep hydrated, and you'll definitely want to keep the sweat from getting into your eyes, etc. I plan on keeping up my Pure Barre attendance when we move. One of my "wish list" items for our new place was having a studio close by. So, look out Pure Barre - Burlington, I'm coming for you! And to all my Pure Barre - The Woodlands ladies, thank you! I will definitely miss "tucking" with you!